Ketchums offers small character tattoo outfits for the permanent marking of very young piglets, dogs, rabbits and chinchillas. These smaller tattoo characters incorporate needle point pins. Standard outfit contains: forceps, characters 0-9, 28 gm. (1 oz.) 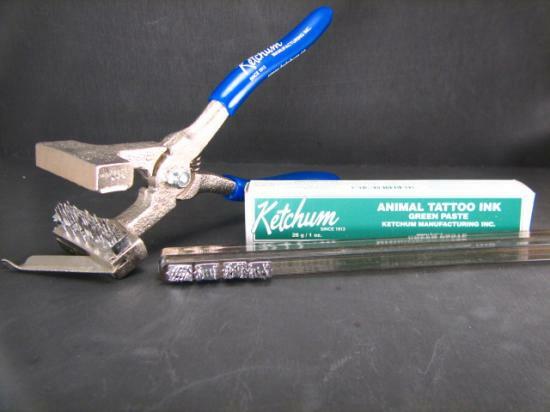 tube of green tattoo paste ink, and instructions. 6mm (1 /4") character size. The model 101 tattoo forcep holds up to 7 characters in one row.